There are 3 raised beds in a corner of the garden which were already in place when we moved to the house. This year I’ve just put a few squash or courgette plants in there and left them to their own devices other than the occasion weeding or watering. This morning I happened to check that area and found what I initially took to be a dead hedgehog caught in the protective netting which was intended to keep the sneaky chickens off the beds. 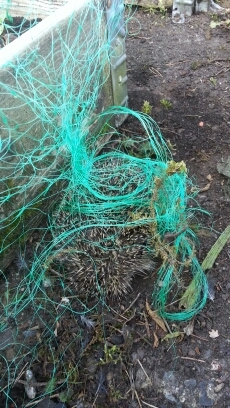 Luckily on closer examination I found that the hedgehog was still alive so I set about untangling the netting which quickly proved to be almost impossible. 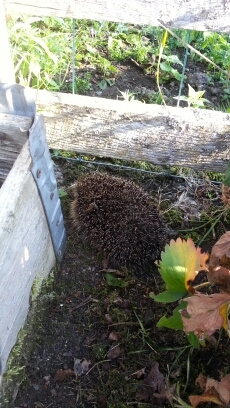 Eventually some careful snipping with scissors was needed but in the end the hedgehog was free to wander off again.